How’s that standing desk thing working out for you? Recently, I shared my simple process for building a standing desk at work. 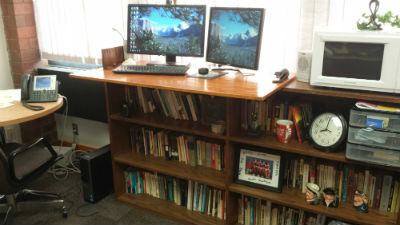 As a college professor, I can arrange my office in pretty much any way I want, but I do believe that similar approaches could work for many people either at home or at work. So how did the use of the standing desk work out for me. My typical work day involves about 90 minutes at the top of the day, two hours in class, and then several hours of office work after class. Over the first several days with the computer in its new location, I assumed that I would do all my computer work standing and then sit for anything else: reading, hand writing, lunch, and so forth. I even went to a garage sale and bought a bar stool so that I could sit at the computer when I needed to. What I discovered was that I almost never sat down either at the desk or on the bar stool. I would sit to read for long periods, but mostly I do that at home. I sit when a student comes in for more than a brief question, but otherwise, I’m on my feet. I even eat standing up, as if it were Passover ever day. What does this mean? According to a calculator at JustStand.org, by standing rather than sitting, we burn .23 extra calories per pound of body weight per hour of standing. With me weighing about 190 pounds, I’m burning an extra 44 calories per hour. If I average five hours a day standing at my desk, that’s 220 bonus calories burned, the equivalent of running about a mile and a half. And I’m getting paid for it. Why is this worthy of my comment or your attention since we’re supposedly talking about the Christian body? Jesus isn’t interested in you getting to eat another Snickers bar, after all. My time, just like yours, is finite. If I can make use of my time to accomplish two things without having one of them suffer, then that’s fantastic stewardship. We’re not talking about texting and driving. Standing while doing computer work makes good sense. It uses the time and body that God gave me in a sensible manner. And if I can get that extra Snickers bar, so much the better.